Clean and convenient hotel with shuttle service to and fro airport. 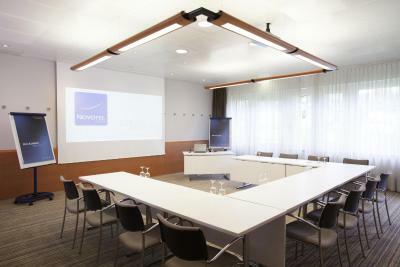 Very convenient location close to the airport (8 mins by tram) and not far from the city center (30 mins by tram). Kindness of the staff, Nice breakfast. Wifi works like a charm and with great speed. 1. 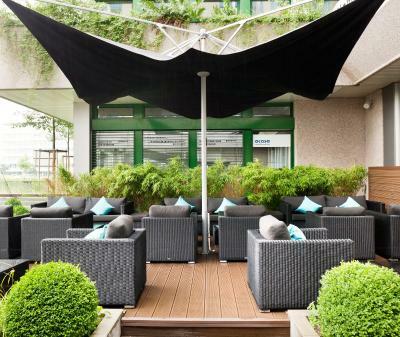 Location: It is just behind the tram station, which makes it very easy to reach the hotel considering that Zurich is a big city. 2. 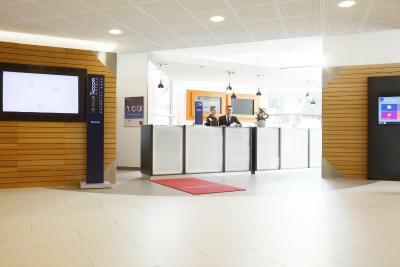 Staff: they were helpful abd friendly. 3. Airport shuttle service: if not mistaken, I think I paid CHF 8 for two.. which is really affordable. 4. Room is clean and good size. Friendly staff, close to the tram stop, good and variegated breakfast. The restaurant is open until 24:00. Great breakfast, nice staff. 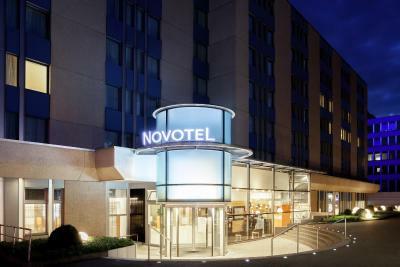 Novotel Zürich Airport Messe This rating is a reflection of how the property compares to the industry standard when it comes to price, facilities and services available. It's based on a self-evaluation by the property. Use this rating to help choose your stay! 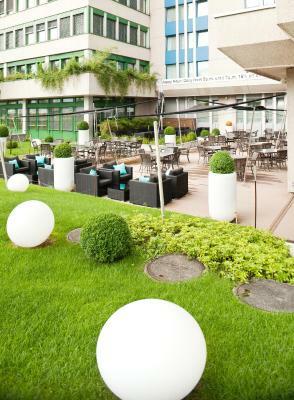 The Novotel Zürich Airport Messe is in the Glattpark & World Trade Centre north of Zurich, 2.5 miles from Zürich Airport. 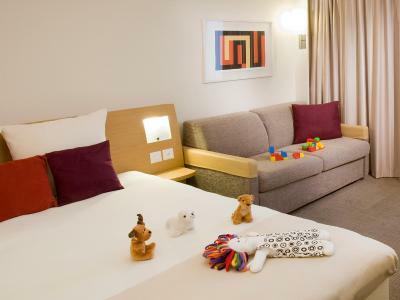 It offers free wired internet in all rooms and free Wi-Fi. Rooms all feature individual air conditioning, a 26" LCD flat-screen TV, free high-speed internet access, wireless internet, a bathroom with a bathtub and a makeup mirror. 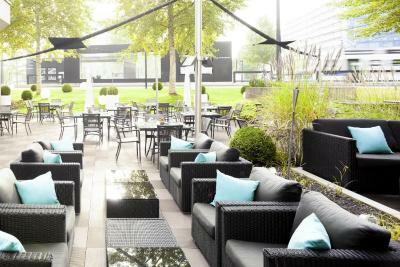 Fine Swiss and international cuisine is served in the restaurant and on the summer terrace. 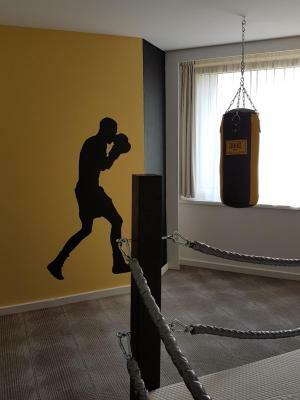 A fitness room is also at your disposal. The hotel has easy highway access (A1, A4 and A51) via the Opfikon-Glattbrugg exit and is as well easily accessible from the center of the city. The International Fair and Events Hall is just over 1 miles away. A tramway connection to the airport and to the center of the city of Zurich (20 minutes) is available as well. There is a tramway stop for the airport and Zurich's city center just 30 feet from the hotel. 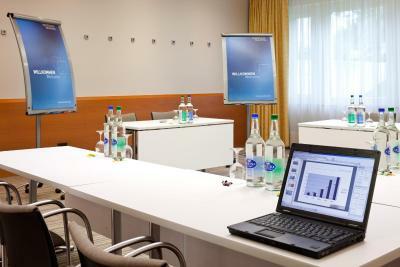 When would you like to stay at Novotel Zürich Airport Messe? 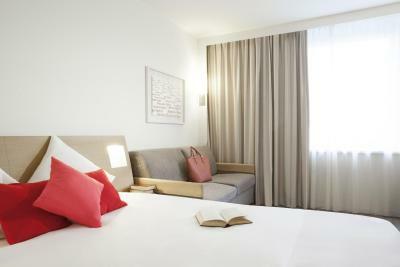 Combining modern decor, ergonomic design and hi-tech equipment, this room features individually adjustable air conditioning, a 26" LCD flat-screen pay-per-view TV, a comfortable armchair, minibar, a makeup mirror and a smoke detector. A spacious room with a minibar, pay-per-view TV, phone with calls to domestic landlines, a Nespresso machine, a smoke alarm, and a bathroom with a bathtub, bathrobes, makeup magnifying mirror, a hairdryer and slippers. This double room has a tea/coffee maker, air conditioning and tumble dryer. 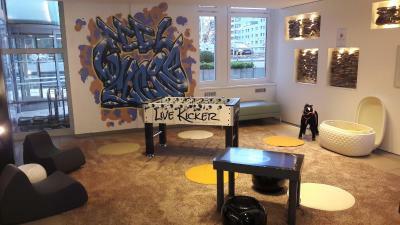 House Rules Novotel Zürich Airport Messe takes special requests – add in the next step! Novotel Zürich Airport Messe accepts these cards and reserves the right to temporarily hold an amount prior to arrival. Though we booked a room for 3, the bed was not made for the third person. There were no bedsheets for the sofa bed. The toilet flush was malfunctioning. When we book one time they do not provide together room it’s separate next 2 day will sort out closer room and food sarvice slow and some people very rudely. Very old hotel for the price you pay it is not worth staying there. 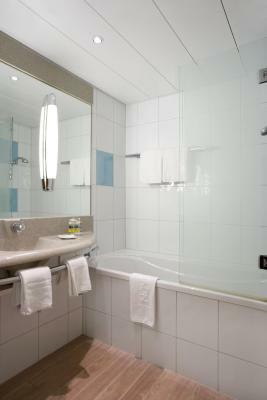 The rooms are nit clean and the facilities are old fashioned. There are definitively better places to stay around that area. Comfortable beds, proper sized twin beds. Fantastic breakfast choices. Useful computer access for flight check-in, printing boarding passes.